Fishing rigs are none other than the combination of sinkers, hooks, spins, and snaps- which you add in your fishing line end. With these combos, you can also add cork and a second hook to make your catch more fruitful. In the line the hook works as the fish catcher, the sinker helps in casting weight and helping the bait to stay under water and for some time using bobber for flotation. If you can perfectly rig a fishing line then you will get a good catch of fishes. For this, you have to know how to rig a fishing line. But if you are new, then you have to learn about the different rigs, hooks, bobbers, and sinkers and also some important things which is much needed while fishing. So stick with me till the end. Now the tricky part is how to connect it to the line. You can connect the bobbers many ways. Before starting with a rig in fishing line, you have to choose the right hook. The hook is the most important thing in fishing. The eye is the part of the hook, which helps to tie the line. Then comes the shank. This vertical part is connected to the eye. There is a curved part of the hook, it is known as the bend. There is offset bend in some hook. The end part of the hook is a point. It is the sharp part and with this fish gets pierce while taking the bait. In the hook, there is a part, which is diagonally back in design. It is Barb. This part keeps the fish attached to the hooking. The gap part is the space between point and shank. You will see there are hooks with three different point. They are 1,2 and 3 point. The single hook is used when you attach the live bait like minnows, worms. The hook is for catching single fishes who loves live baits. With double hook, you can use a live bait and a spinnerbait to get a good and powerful catch. With 3 hooks you can catch cat fish by setting the hooks with live and artificial bait. In this hook, you can also use a home-prepared bait like a marshmallow. To know about the size and number of the hook is important. They both depend on the bait and fish you are using. The numbering and size are little complex but if you observe it carefully then you will understand. In the matter of size, you will see numbers like 1-32. These refer the size. But the large number doesn’t mean a big hook, it means the size of the hook is smallest. 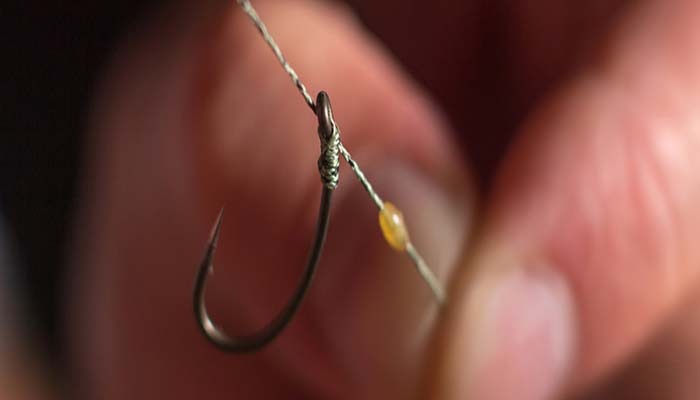 For an example, if you see 32 sizes of the hook then it is the smallest hook of all, again if you see 1 size of the hook then it is the largest hook. You will see aught hook size. Let me explain when you will see 1/0 this means one aught size. The hook is 1 size. And if you see 19/0 size then it means the hook is large. The best size hook is 5/0 and 10 number hook. This is the standard size of the hook. Though there are 3 types of a hook the single hook comes in different styles. Each style is for the different fish type to catch. Aberdeen hook style is for catching pan fish and walleyes. The hook has thin wire and long shank. You can use grubs and minnows as bait. Bait holder hook style has a barb in the shank, which helps to get hold of grubs and worm for long. The circle hook is designed with a bend and point, which is wide, and points toward the shank. With it, the fish don’t get severely pierced. Octopus hook is designed with a gap between eye, point and round bend. You can use cut bait, minnows, walleye and pike as bait for catching bass, catfish. The rotating hook is curved hook, which pierces in the fish mouth in any angle. Salmon hook is for lure fish with eggs and it has the design of offset bend and turns up the eye. Weedless hook has thin wire or heavy single wire, which helps the hook working in bush or weed. Worm hook is for rigging artificial worms. After choosing the right style and size of the hook, now it is time for choosing sinker. Generally, the sinker is made from lead, but for environmental awareness, the material has been chosen to steel and tungsten. The split shot sinker is small and round. They are attached to the line with pliers or finger press. Rubber core sinker is long sinker with a slot in one side and a twisted rubber core to secure the line. Casting singers are for attaching the wire eyes in the line. Drop shot sinkers are cylindrical in shape and help to keep live bait in place. Disc sin7ker is designed to lay flat in the water. Pyramid sinker stays in the bottom fresh water condition. Bullet sinker is sliding sinker. Egg sinker is also a sliding sinker but it is heavy. You have to choose the type of the sinker based on the bait type and fish you want to catch. There is one thing about sinker; you do not need to use it all the time. It is better to use the lightest sinker when you are fishing with light bait. But don’t use sinker when you have live and heavy bait. You will find boobers made of plastic or cork. Plastic bobber is the most popular one. The bobber is used for seeing the bait taken by fish or not. If the bobber is going up and down in the water then you can guess that you have a catch. Round shape bobbers are the most used bobber by fishers. They are made from plastic. They come in different colors like red or orange or yellow. Teardrop shape bobber is plastic made and has the stopper. It can be used as the sinker. Oval shape bobber is cork made. Though the shapes are different the task is same. The attach plastic made bobbers has spring hook. You can connect it top, bottom or on both ends. Slip bobbers can be passed on the line and slide up and down when it is necessary. Spring bobbers have spring with them and are passed through the line to work. The size of the bobber depends on the bait size you use. but it is advisable to use the smallest bobber to keep the bait floating. Because the fish can easily notice a big bobber when it comes near to the bait. Boobers is not always needed. It for only when you want your bait to keep in the bottom. If you want to prevent the unwanted twist in the line, use swivels. You use the swivel when you have no hook and lures like spoons and crank bait is used. With barrel swivels have loops. You can tie the one end of your line to swivel and the other end of the pole. Snap swivel has pointed snap in the end. You can change artificial lure quickly if you have this swivel. If you use wire leader then it will help you in luring the fish. The wire comes in different features. If you want you fly fishing then use light monofilament leader. When you want to fish in bush or weed then use heavy monofilament leader. Want catch teeth fish like pike or muskellunge then use the wire leader. - Insert 15 cm line through the hook. - Start to wrap the line end and the reel-attaching end 5- 10 times. - Then fold the line back. - Insert the line end through the space between the hook and wrap part. - Then again, insert it in the loop. - Then pull them to make a knot. - When you are done with tag, cut the excess parts. If you find this knot hard, you can go for Palomar knot or uni knot. Just make sure the knot is strong and long lasting. Know the water depth where you want to fish. Try to keep the bobber and line distance as the same distance between the water surface and bottom waterbed. In your line end, tie a hook. Use 1 or 2 split shot above the hook. Just use some weight to keep the bait bottom of the water. Then attach a bait in the hook. Use a pole which is 18-24 inch. In this pole, you can use snelled hook or short length pole. Tie hook and swivel on both ends. Then tie the line to the swivel. Tie the line to one eye of a 3-way swivel. Use 18 to a 24-inch line to the second eye for getting a drop line. Then use 24 -36-inch line to the third eye, which will serve you as bait line. Then tie a hook in the bait line and start fishing. Take a 24-36 inch leader and tie it to drop shot sinker. Then tie both ends of your leader and hook with the line. These are the rigs that are mostly used for fishing. They are simple but effective. Finally, this was all about how to rig a fishing line. If you do it properly then you will get the great catch of fishes. Fishing is a way to enjoy your leisure time and a great time passing with your friends and family. You will also enjoy a refreshing and calm mind when you are near the water and fresh air. The happiness will grow more if you can get fishes by catching them. Though it is tough for the beginners if you can catch and apply the fish rig techniques, then mister you will be the best angler in town. So just, pay focus while you are catching fish. As for rig a fishing line, make sure you have the proper thing, good environment, clean water and water full of fishes. Make the fishing line perfect by a rig. And remember to use the perfect bait for the fish you want to catch. When you think you are ready with the fishing line, then go for the fish man and enjoy! !